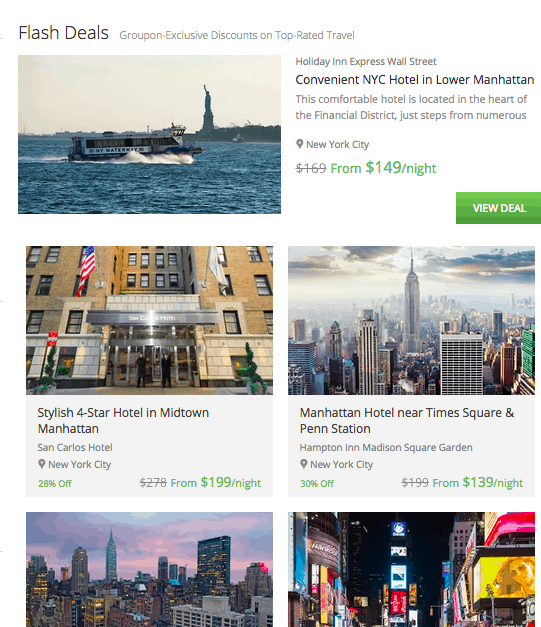 You are here: Home / Groupon / LOW Hotel RATES for New York! So today my friend and I booked our flights and hotel to go to New York to attend #BlogHer15, #BloggerBash, and go and see Late Night with Seth! We really got lucky in getting those tickets! This trip is going to be 3 nights of craziness, fun, and business all into one! Since my friend and I are BOTH bargain bloggers, it is ONLY fair that I share the awesome hotel deal we got by booking through Groupon Travel! Our hotel is only 15 minutes away from the conference. I really want to attend the conference but I didn’t want to stay at the hotel because of the business of the front desk, check in, and check out process. I also am not ONLY going to New York for one conference, I am scheduling meeting with some of my reps and companies that I work with throughout the year! Here is the hotel that we picked Doubletree which is also a Hilton hotel! You might be able to find a better deal (there were many out there still) at different hotels. We just liked this one and chose it! –> Check all the hotel deals here.